All the tests provided by Health Check Shop have undergone independent testing to show that all the components are easy to use by laypersons. We know that you will want a result as soon as possible but please don’t touch any of the components until you have read and understood the instructions completely. If there is anything you don’t understand please ask us for help before starting. For hygiene reasons, the sterile lancets (finger prickers) provided by Health Check Shop are single use. That means that once the lancet has been activated by pressing the button you will not be able to reuse. The lancets are medical devices, manufactured according to a strict quality assurance system and have been used in tests like you have received and by hospitals all over the world for more than 20 years. It is highly unusual for any of these lancets to fail if used correctly. However, we appreciate that you may not be a nurse or doctor, so with many of our tests we will send you one or more spare lancets, just in case you did not press firmly enough on the first attempt. The needle in the finger pricker will only penetrate to a millimetre or so and is very sharp, so you are unlikely to feel any pain. Be brave and press the lancet very firmly against your finger tip before pressing the button to activate it. If you are using one of our 'return to lab blood collection packs, the lancets are used as in the pictures below. If using ANY other test please follow the specific instructions with that particular test as different lancets work in different ways. 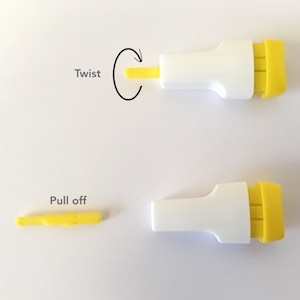 Firstly, twist and pull off the thin yellow tab - you may need to twist a full revolution before pulling the tab off. Press the lancet firmly against your finger tip before pressing the yellow button. If you think that you may have a problem using the finger prickers please contact us for advice, we are always pleased to help but never use a sewing needle or other implement to obtain your blood sample. Sewing needles are blunt, carry a risk of infection and can be painful compared to the sterile surgical lancets provided with our tests. Some of the tests we provide give a result within minutes. These tests have been demonstrated to give results as reliable as an NHS laboratory test and are regulated in the same way. In fact, self test kits used at home are more strictly regulated than laboratory tests as manufacturers have to prove that the home self test kits can be easily used and the results interpreted correctly by most laypersons. If you have ordered a laboratory test you will need to complete a comprehensive health questionnaire which allows our doctor to review your test results with reference to your clinical history. If you have ordered a self test kit with instant results then the information provided with the test will help you to review your results yourself. If you need any clarification as to what your results mean we encourage you to contact us for help either by phone on 0845 094 1861 (Monday to Friday 9am to 5pm) or anytime through our contact form. It is important that you do not change your medication or diet before speaking with your own doctor. We cannot provide medical advice.